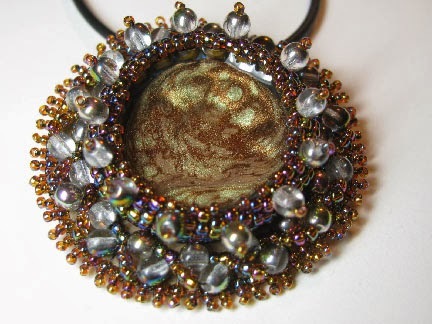 This bead embroidered pendant started off its life as part of a different project. 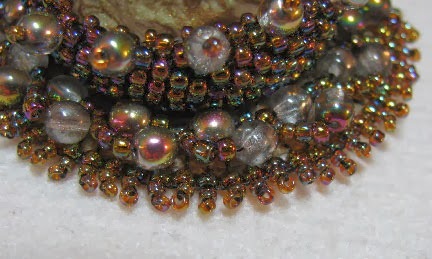 I originally intended it for the centerpiece of a bracelet made from antique hinges. When it turned out to be too big, and not really suited style-wise in any case, I let it sit on the table until I decided what to use it for instead. 1. 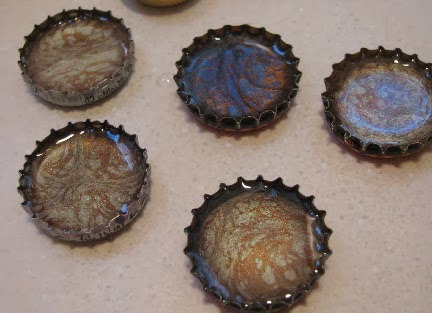 I started with cabochons that I made from bottle caps and Bezel Effects paints, topped with resin. 2. 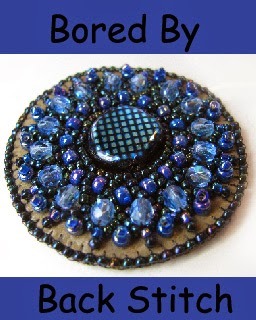 Create a peyote bezel around the cap on some beading foundation material using size 11/0 seed beads, drawing it in over the top with size 15/0 seed beads. 3. 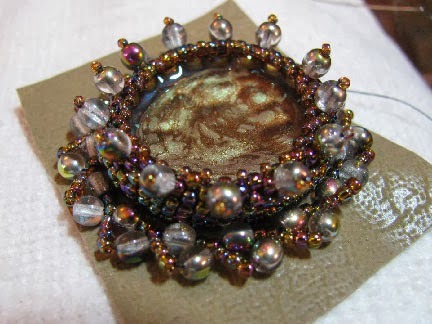 I chose a bead embroidered form of Russian spiral to surround the cap. 4. 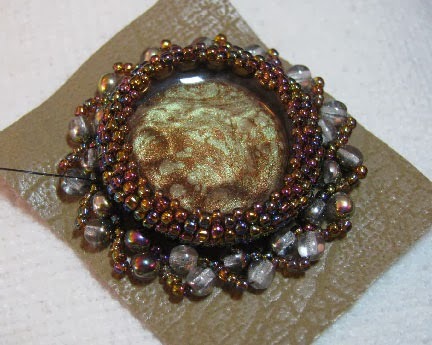 For a little extra embellishment, I stitched back up into the bezel and added some 4mm round glass beads. Clip the foundation fabric, back it with another piece, and clip the backing to match. 5. After adding edging brick stitch around the outside to attach the backing and to cover the raw edge, I chose a very simple stack stitch embellishment. 6. On the back, I added a square stitch bail. All done. Wear it. 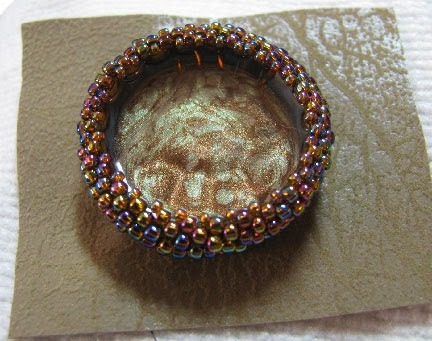 Watch people's eyes widen when you tell them the cabochon is a bottle cap! This post contains affiliate links: Beadaholique. The Bezel Effects paint was given to me at no cost by PJTool so that I could develop this free project for you. You mean the beads closest to the top of bottle cap opening? 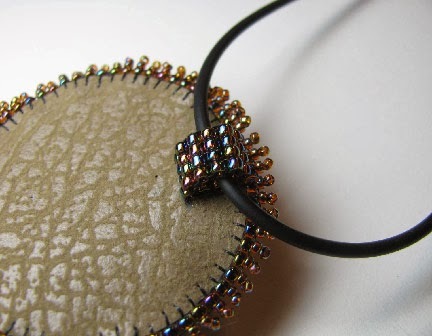 I simply stitched back around through the peyote stitch bezel and added them, spaced out along one row. That's gorgeous, Cyndi! I love the swirly effect you got with the paints and resin.